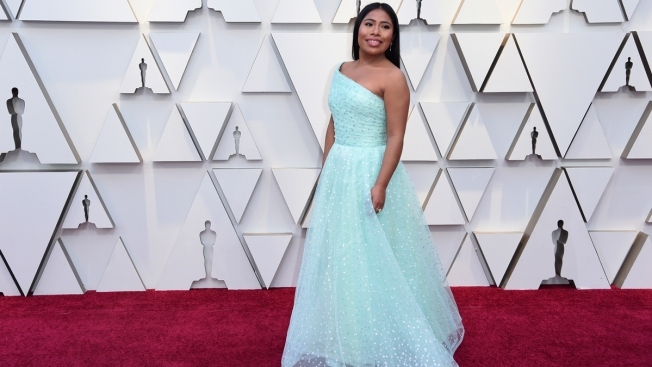 Yalitza Aparicio arrives at the Oscars on Sunday, Feb. 24, 2019, at the Dolby Theatre in Los Angeles. A television personality for the Mexican-based Televisa network is facing strong criticism after dressing up in "brownface" and wearing a prosthetic nose to make fun of indigenous Mexican actress Yalitza Aparicio. Televisa's Yeka Rosales recently posted photos and videos of herself on social media wearing brown skin paint and thick lips in an apparent parody of Aparicio, who attended the Oscars last week after being nominated for best actress. The stunt, coinciding with the Televisa's season premiere of the comedy show "La Parodia," highlights the racism some scholars say indigenous people in Latin America still face in media. 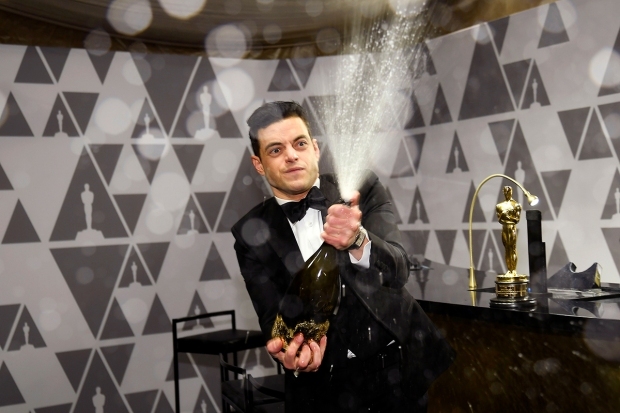 In the photo, Rosales wore a dress similar to the one Aparicio wore at the Oscars. Rosales also donned a straight, black-haired wig and made exaggerated facial expressions typically used to stereotype indigenous people. In an email to The Associated Press, Televisa spokesman Alejandro Olmos said the network strongly condemns any form of racism or discrimination. "We do not believe that the production of 'La Parodia' engages in this type of practice," Olmos said in Spanish. But Olmos said some of the comments were made in "bad taste" and will be edited from the show. Televisa later deleted a tweet of a video of Rosales in brownface mimicking Aparicio. Rosales drew immediate condemnation on social media in Mexico and the U.S.
"It's disgusting. I'm kind of shaken up about it," said Jennie Luna, a Chicana/o Studies professor at California State University Channel Islands in Camarillo, who studies indigenous populations in Mexico. "This just shows how far we have to go and how far Mexico has to go." Luna said Aparicio has encountered many similar acts in Mexico since garnering praise for her performance in the movie "Roma." Aparicio, who is from the Mexican state of Oaxaca, faced racist attacks online and scorn from some Mexican actors. However, she also found strong support among Mexican-American women in the U.S. who identified with her indigenous roots. William Nericcio, a professor at the Center for Latin American Studies at San Diego State University, said that given Mexican media's historic treatment of indigenous populations, he isn't surprised by the actions of Rosales. "The Mexican elite disposition has always portrayed indigenous people as funny and ugly," Nericcio said. "Networks like Televisa profit from this." This time, Nericcio said, indigenous people are speaking out, also through social media. Rosales defended her actions, posted photos of herself in blackface and said she parodies people of all races. "I do not discriminate," Rosales wrote in Spanish on a meme of photos of herself in blackface and as Princess Leia from the "Star Wars" movies. "I interpret people of all the skin colors and races and ages that exist in the world." She then asked why no one was offended when she previously darkened her skin and dressed up as black disco icon Donna Summer. This isn't the first time Televisa has faced accusations of insensitivity in portrayals of people of color. In 2010, the network drew criticism for hiring actors in blackface for a popular morning program during the World Cup in South Africa. Associated Press Writer Russell Contreras is a member of The Associated Press' race and ethnicity team.